I’m not sure that butter would melt in Donald Rumsfeld’s mouth. At the same time after seeing Errol Morris’s film the Unknown Known I would very much like to spend an evening having dinner with him and having him tell stories. I may not agree with his world view but it’s utterly fascinating listening to him talk about his life and career. The film is a simple illustrated interview of Rumsfeld by Morris. We listen as Rumsfeld talks about his career from his run in 1962 for congress through the Nixon Administration, the Regan administration and of course his time in the George W Bush administration. Morris asks the questions and Rumsfeld answers them. I’m not sure who the winner is, all I know is it makes for fascinating viewing. One of the truly interesting things is that during the course of the film we have Rumsfeld confronted with his many memos, which sparks discussion of what he meant, what was reported and most importantly what the words actually mean. Rumsfeld is a stickler for meaning and we see the numerous documents he spawns discussing definitions, as well as clips with him discussing words with the press corps. As for his exchanges with Morris Rumsfeld is as good as he gets and he is ready to correct his interviewer when he feels he got things wrong. If there is one real flaw with the film, its that the film assumes you know who Rumsfeld is. You can’t walk into this film without knowing who he is and have it play well…or rather it will take a bit before it all comes together. You have to be up on semi-current events and know what happened on his watch. On some level I’m not sure what I think of the film, it’s not a conventional interview. 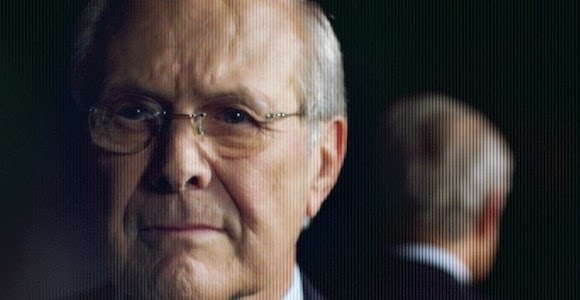 While it deals with Rumsfeld and what his did the film strangely feels less like an attempt to uncover history than an attempt to uncover the man. There are lots of questions I wish had been asked but at the same time never have I had a better sense of Rumsfeld the man. As much as I dislike much of what he was part of, it’s clear he is not a monster. I’m sure you could argue that him not seeming to be a monster makes him a monster, but at the same time we get to see how he saw the world which changes our perception. While I’m not sure what I think of the film, I am certain it’s a really really good film. The reason I say this is because it forces you to engage with it. It’s a film that makes you react to it. It’s a film you’ll have to wrestle with because even though it often seems light weight it’s still raising heavy questions. Hell, I went in disliking the man and now I want to have dinner with him. The film is the opening film for this year’s DOC NYC which starts Thursday. If you can score a ticket I suggest you do so. Director Errol Morris will be there and it will no doubt be worth hanging around to hear him talk about the film.-and it will be wort hearing the audience react to the film- expect lots of heated arguments.